The 2016 Atlantic hurricane season forecast calls for the number of named storms and hurricanes to be near historical averages, with a total of 12 named storms, five hurricanes and two major hurricanes are expected this season. Pacific hurricane season forecasts also call for a near average season with 17 named storms, 9 hurricanes, and 4 major hurricanes. As a former PIO for a large emergency medical services organization myself, I know that the PIO, or public information officer, is a critical link between the organization we work for and the communities we serve. In a hurricane, the PIO’s role is to provide the public with timely information needed to make informed decisions regarding their personal safety and well-being. The PIO must be prepared for deployment at a moment’s notice. Experienced PIOs know that anything can happen, regardless of the weather forecast, and prepare accordingly. Here are a few tips for new PIOs to prepare for this year’s tropical storm season. Educating the public about the hazards of severe weather should be an ongoing effort, with additional campaigns launched before and during hurricane season. Awareness and preparedness campaigns provide critical information that people need to be ready for sheltering in place or evacuating when ordered by local officials. PIOs have numerous tools at their disposal to inform, educate and advise– including websites, blogs, printed materials, video, public service announcements, media releases, briefings and others. PIOs are often invited to deliver preparedness talks to community groups, and should have standard presentations and handout materials at the ready. Common public education campaigns include general hurricane preparedness, homeowner preparations, family and business emergency plans, severe weather awareness and preparation for special needs populations, such as the elderly. Every PIO should understand the basic strategy to prepare for an evacuation in the event of a severe weather event. I recommend the PIO talk with the incident commander, operations section chief and liaison officer to understand what trigger points they will use to make a decision to evacuate. Monitor the proximity to those trigger points and be able to explain to the media and others why an evacuation is being considered. By sharing that evacuation is a possibility, the PIO is helping the media and the public to prepare appropriately in case the order is given. Don’t forget power cords, extra batteries and alternate charging accessories for all portable electronic devices and radios. The kit should fit in a comfortable bag or backpack. 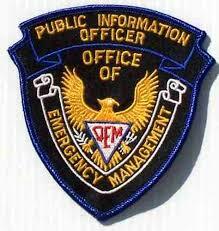 There are numerous resources to help the PIO to prepare and respond to a major weather event. Ongoing training and exercises are also a key component of disaster preparedness. The most important things the PIO can do to be an effective community resource are these three Ps: Prepare, Practice and Pack. Here’s wishing you a quiet hurricane season!